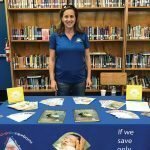 The Safe Haven Newsletter - March 2018 - A Safe Haven for Newborns | Pregnant Need Help? Registration is now open for our annual Tee Off for a Cause charity golf tournament on the Red Tiger golf course at Trump National Doral. The tournament is open to both men and women to come, play and help us in our fight to save the most vulnerable among us, the newborn. The tournament entry fee includes green fees, boxed lunch, award reception and beverages on the course and at the reception.